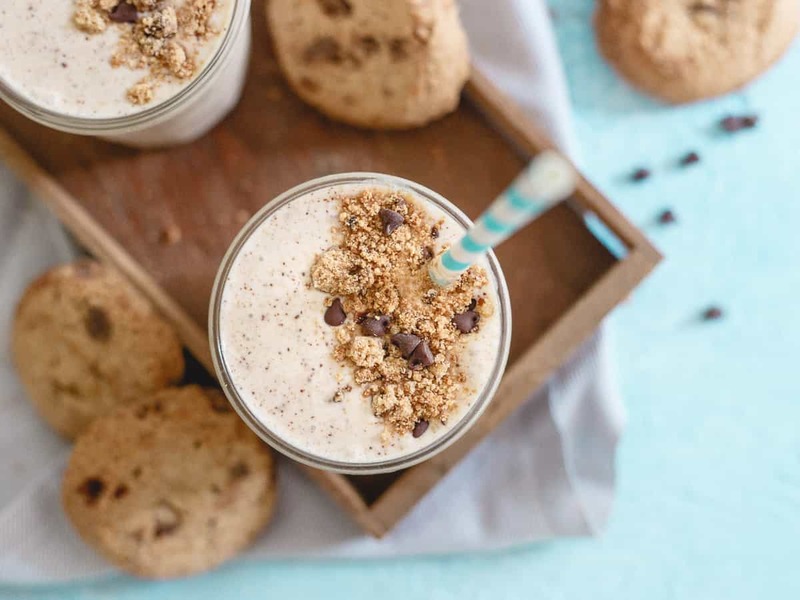 This chocolate chip cookie milkshake is made with maple pecan gluten-free cookies, coconut milk and cashew butter for a creamy cookie dough tasting treat! Milkshakes aren’t something I think about a lot. They’re never my go-to order at a ice cream place and I kind of forget they exist (much like floats) but when I recently re-made this roasted strawberry basil milkshake, I was reminded of their creamy goodness and perfection in the world of ice cream treats. With Father’s Day right around the corner and the hot weather finally making an appearance in New York, I figured it was time for another one. 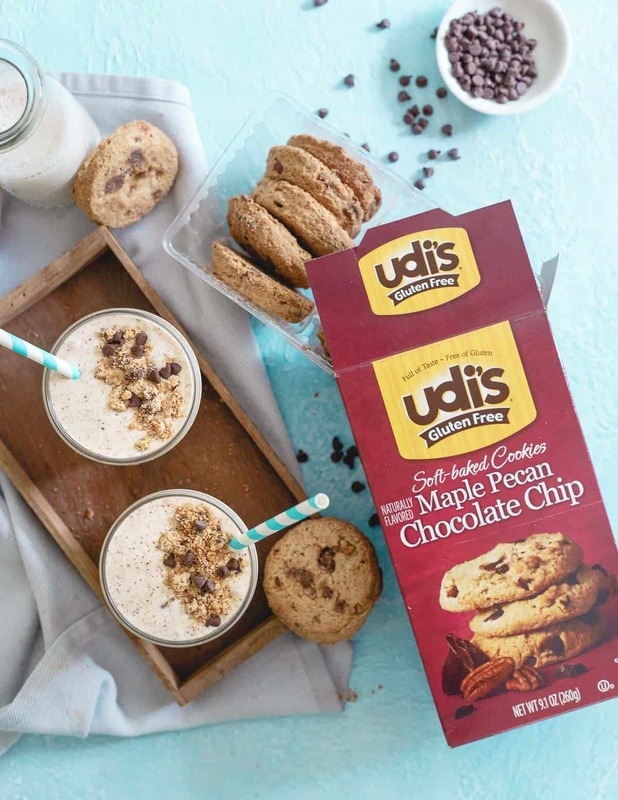 *This chocolate chip cookie milkshake recipe is sponsored by partner, Udi’s Gluten Free. My dad is a butter pecan ice cream guy through and through. Such a weird flavor to be attached to in my opinion when novelties like cookie dough, fudge swirls, peanut butter, caramel and all the other (better than butter pecan) options exist but hey, to each their own I guess. When I saw Udi’s had new soft baked cookies (the best!) in their product line up, I knew some kind of summer treat had to go down with them. The maple pecan chocolate chip cookies immediately reminded me of my dad and his beloved butter pecan and I knew blended with some vanilla ice cream and cashew butter they’d make a creamy, decadent treat not only any dad would like on his special day but anyone, gluten-free or not, would be down for sipping this summer. I’ve always thought cashew butter tastes like straight up cookie dough and cake batter combined. It’s by far my favorite of all the nut butters and it’s the perfect milkshake addition to get that creamy, batter/dough-like taste in a slightly healthier way. When you combine it with cookie crumbles, a few extra chocolate chips and ice cream and it just becomes blissful. This was one of those recipes I fully intended on just having a taste of before passing off to my live-in garbage disposal Ulysses but instead ended up ravenously spooning into my mouth over the sink while cleaning up and polished off both servings myself. He was upstairs studying, completely oblivious to the milkshake situation in the kitchen so what’s that saying? 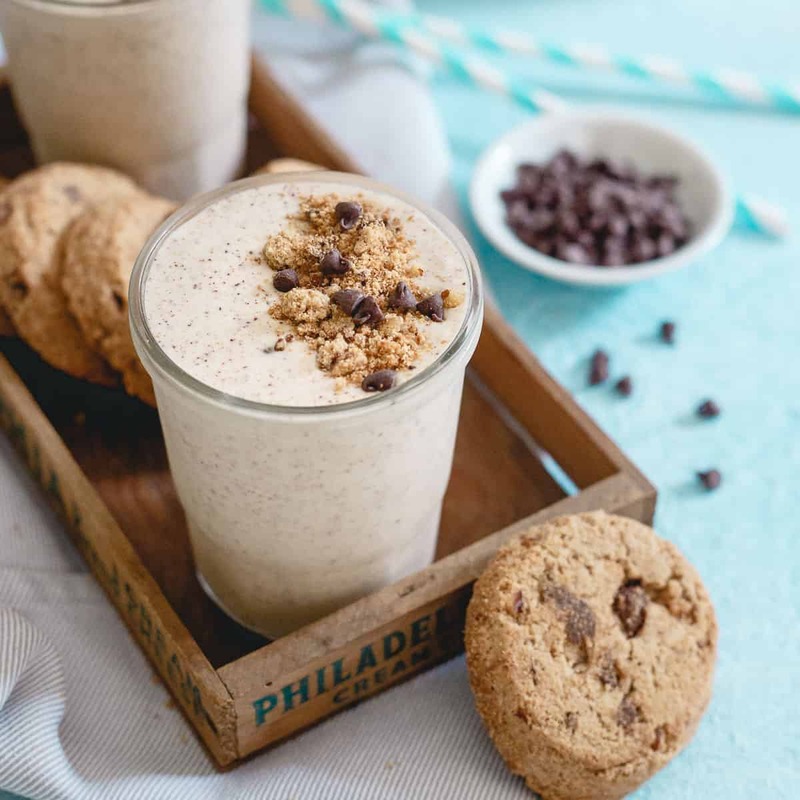 Whether you’re making this for dad this weekend or just for yourself because you hey, who doesn’t deserve a creamy chocolate chip cookie milkshake every once and awhile, may I highly suggest a soft baked maple pecan chocolate chip cookie on the side as well? You know, just for good measure. Happy sipping! 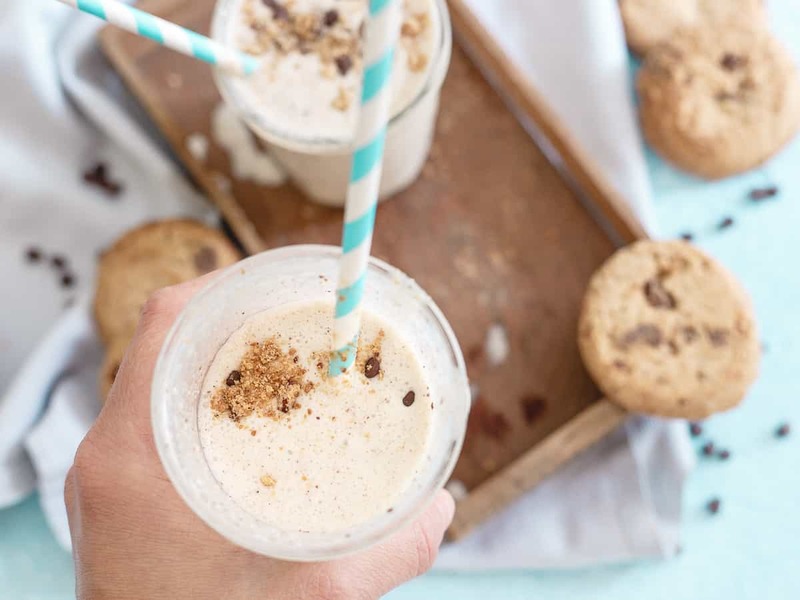 Love this maple cashew chocolate chip cookie milkshake recipe? 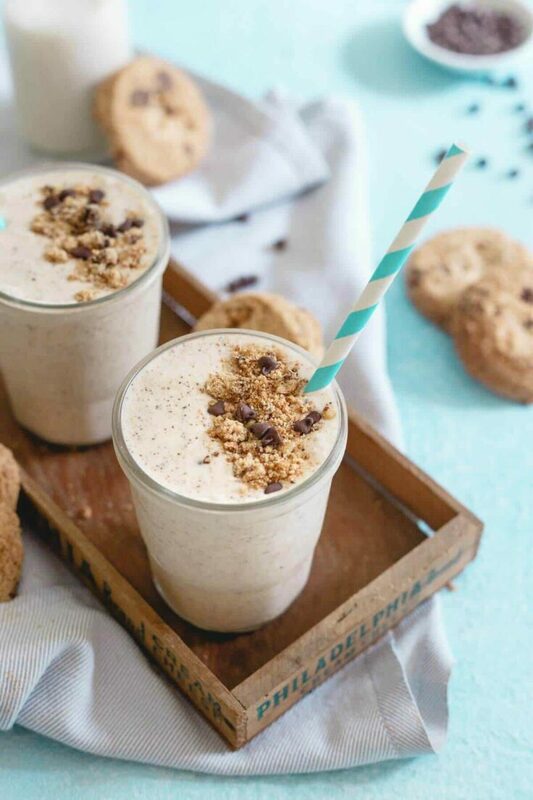 Combine coconut milk ice cubes, ice cream, 2 cookies, cashew butter and vanilla in a blender. Blend for 10-15 seconds until combined. Add the chocolate chips and blend again for 1-2 seconds just to incorporate. Pour the milkshake into 2 serving glasses. Crumble the remaining cookie on top and garnish with a few extra mini chocolate chips. You can skip this ice cube step if you're in a hurry and just use the coconut milk unfrozen but you will want to add a few ice cubes to the blender then for that cold/icy milkshake consistency. I love the idea of making this milkshake for dad!!! and my kids will go crazy for this, LOVE!!! and love those cookies crushed on top! brilliant! You’re speaking my love language!! “maple pecan gluten-free cookies, coconut milk and cashew butter ” <– heavenly!!!!!!!!!! I am loving the sound of this! So many wonderful flavors in one milkshake! I’ll have to keep a lookout for these cookies Gina! They sound heavenly. Bet your Dad would love one of these milkshakes for Father’s Day! I NEED this in my life. It sounds incredible! Love anything maple and anything involving cookies! These looks and sounds amazing, such beautiful shoots too.